It is surprisingly easy to make. The broth takes the most effort, but only because you have to let it cook away for over an hour. This is a great dish to impress dinner guests, and uses up leftover chicken from a roast dinner, making use of the bones as well. The herbs and beansprouts are served to garnish your pho and mix in. You tear the leaves up with your fingers and stir them into the broth. The sauces are to dip your meat into for extra flavour, rather than squirt into your pho, but that is down to personal preference! To accompany: We didn’t actually drink tea with this meal. It was a muggy, very warm day, so we opted instead for Grace aloe vera drink in Original flavour. I love aloe bits and the grape flavour in it- reminds me of the grape juice we drank when we were in China. Preheat the oven to 180˚C (slightly higher if not a fan oven). Half the onion and place it and the ginger on a baking tray and put into the oven. After 10 minutes, turn the tray and cook for a further 10-15 minutes. Remove and allow to cool. While the onion and ginger is cooling, heat a wok on a high heat and add the coriander seeds. Dry fry until aromatic and then take the wok off the heat. Remove all meat from the chicken. Add the bones to the wok with 1 ½ litres of water. Put the chicken meat in a small bowl and refrigerate until needed. Once cool, peel the outer, brown layers of the onion and carefully peel the ginger with your fingers or a blunt knife. Slice the ginger thickly and add the onion and ginger to the wok with the cloves, star anise, sugar, fish sauce and coriander stalks. Bring to the boil and turn the heat to low, so that it continually simmers, for 1 ½ hours. Take off the heat and strain out all of the bits. I used a Chinese spider (a large sieve type strainer), but a small sieve will work. You need to make sure that all of the bits, including the coriander seeds, are removed. You should have a nice clear broth left. Take the chicken from the fridge and allow to come up to room temperature. If you have normal beansprouts, blanch them quickly in boiling water (the Good4U sprouts can be eaten raw so you can miss this bit you have those). Arrange the fresh herbs, beansprouts and lime wedges on either individual plates or one large platter. Serve little dishes of the sauces for people to dip their meat into. Heat your noodle bowls in the top oven and bring the broth back up to boil. The chicken is not warmed so you need everything else to be really hot to warm it through. Add the noodles to a pan and cook as per cooking instructions. If you are using fresh ‘straight to wok’ ones, they simply needed to be brought to the boil in water. Drain and divide between the bowls. Add half of the chicken to each bowl and ladle over the broth. Serve with your plates of fresh herbs, beansprouts and lime wedges. Squeeze over lime, as desired and flavour with extra fish sauce if needed. Tear the leaves of the herbs over the broth and stir to infuse the flavour. Dip chunks of the chicken into the sauces for flavour. Enjoy! 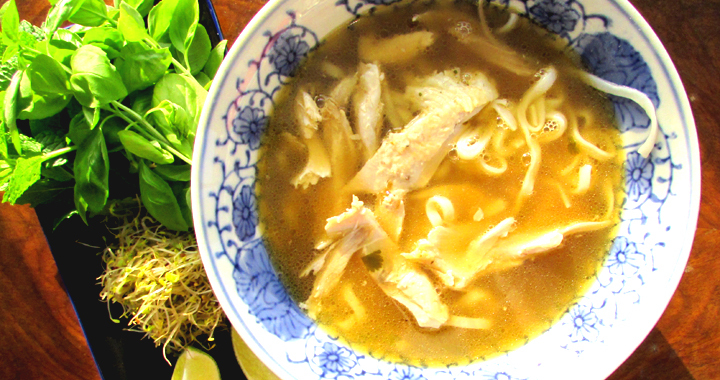 Posted in Main Dishes, Recipes and tagged Chicken, Main dishes, Noodles, Pho.